Pro BB player is really a [content removed], MAKE DD GREAT AGAIN! Today i just got 5streak lose with Ryujo. i dont have a problem againts enemy CV...... most of them are noob. i realize, most of them (3 match) are caused by Pro BB...... half of your team destroyed less than 8~12 min by devastating strike? seriously? THE MOST annoying is, BB sail through the island and make it harder to drop torpedo..... DD should be able to kill BB with its devastating torpedo.....but where is DD? valentine is near.... so DD need more love too! - make DD torpedo concealment better! bring back stealth DD....encourage DD to kill BB again! 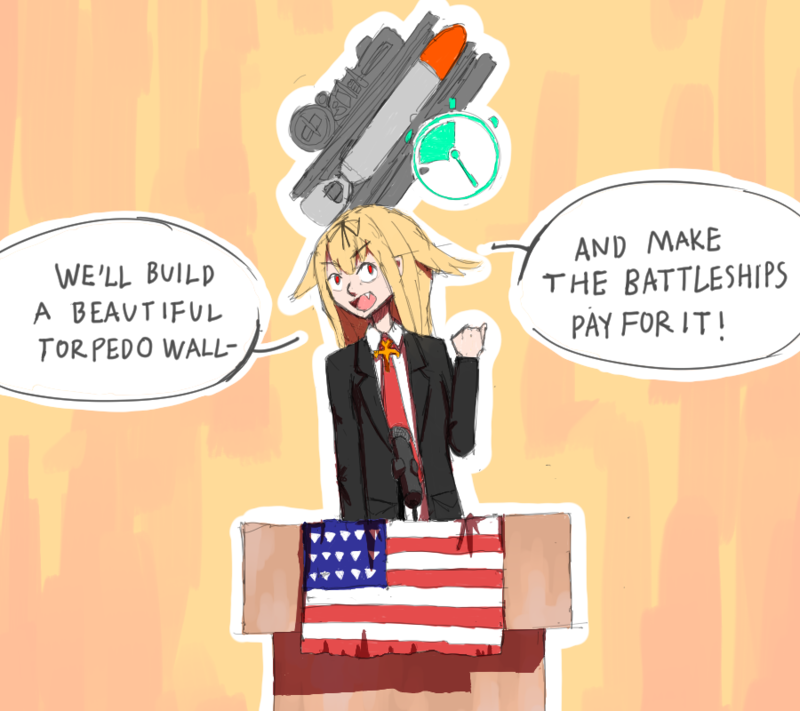 BUILD A WALL, BUILD A WALL MADE OUT OF TORPEDOES AND THE BBS WILL PAY FOR IT​, RIGHT NOW THE DD DREAM IS DEAD. NO! TURN THOSE SPOTLIGHTS OFF! OFF! In the end , BB larger than ? 50k tonnes turn slower, meanwhile no more torpedo soup. The problem now is IJN DD especially those with weaker guns are now in trouble.. Weren't you quitting? I am sorry but I saw your other posts about CV and I remember reading you saying in capital words "I QUIT". So what happened to that plan? Really? Blaming people for they play well? That's really Drumpf-y. It's asia so pretty much everyone play DD for some kind of faith or sth. Probably KanColle or sth. It's normal, don't expect too much from destroyers, especially the IJN DD, and this time the MM is mean to you. Yesterday I was playing my newly bought Zao, and each time when there are T10 destroyers, my team gets a Shimakaze while the enemy gets a Gearing. So I experienced a painful losses. But still I have a overall WR of 50% on this ship. Or my Mogami, the last day on her was totally painful, IIRC I even posted a little rant about this, but still 56% WR. As for me, I don't really feel excited when I win (unless I did a huge part in reversing the outcome, which isn't that common for a noob like me), but I do feel frustrated when I tried my best and lost. So probably OP feels the same. 1) Get your torp game on. Focus on taking apart the team if you can, cruisers and DDs first. 2) A good DD can be extremely devastating. Try the high tier USDD line if you haven't, it's amazing. 3) Same thing applies to good BB players. Go get your Yugumo and F3 torpedoes. Now launch those ungodly 76 knot water rockets (or 81 with TA) and watch any ships desperately try to evade. That being said, there are really good players, and I do feel your pain. But that's MM for you, and MM strikes us all somedays. its not a blame, its compliment for playing too good..... but i dont know people will misinterpret my Ri(p)nglish.... i think i should start to read more about the real meanin or thesaurus of a word. the real problem is the deadly secondary from BB..... especially Gnesinau..... DD cannt survive, and most its torpedo missed! The issue is some players who play mostly DDs dont get the dynamic on how important DDs are. - secondary roles of AA and Sonar Duties. This is a meme you are asking for? Can't help it. There's not much incentive for a team play in this game. The exp point for acting as support, like AA, spotting, smoking and sonar/radar is very low. So everyone from a DD to a carrier doing the exact same thing, farming for damage and kills. The problem is, some ship are better than others in that regard. Yes, perhaps. But its not like you loose credits for doing these things... Dds are force multipliers for the team... And in many ways, can influence the match...specially when it comes to capping. Naval combat always had an element of Team Play...regardless if in a game or in real life.. Hence, overlaping Support capabilities for each ship. Just so happned theres alot of things the DD can do more effectively because of low concealment. I have mostly played T7 DDs so far in the game, its like 1/4th of my total played games. Never felt the problems you mention. My problem is friendly CVs never support DDs unless in the same division or a quality player which is quite rare. beside defending from bomber attack, what kind of support DD need? this will be valuable info! Dive Bomber attacks are mostly RNG based and there is a way DD can defend itself from them. TB cross drops however, quite impossible to dodge if dropped by decent CV players. DD may not die but losing 3/4th of the HP is almost the same as being dead in a DD. But what I feel is, defending a DD against friendly strike is not always possible and that is ok, but when enemy CV keep the friendly DD spotted or keep scouting for friendly torps and the friendly CV is too busy farming damage on the blue line enemies which are practically no threat and keeping the fighters idle over some mountain, that is a problem. That is the CV player who ruins the game for the whole team single handed. Scouting and counter scouting is best way to help friendly DDs. This should be the first task. Killing enemy DDs and defending friendly DDs is the second one. Last but not the least, CV player has the easiest time analyzing the battlefield, he can easily see the mistakes of friendly and enemy ships. Help the friendly ship who is doing the right thing, or trying to make something happen, help the one who is oppressed, or punish the enemy making mistakes, take enemy cv's focus to somewhere else. (AS Vs Strike). Play Russian dds, farm arsonist awards, dds don't need a buff. I think what the OP should do... is actually PLAY a DD to understand its dynamics. Apparently.... Not a single game in DD. If you want to talk about Trump best you post on US server. I cant speak for everyone, but I would guess that most on Asian server dont really care at this time. Leave the politics and commentary for other places. That's what I tried to say, you were better at it.